Father, you are mistaken, and I can understand how that is possible. Remember, St. Vincent Ferrer was mistaken and backed an antipope for a time – and was so holy that he continued to perform miracles even while he was commemorating the wrong man at the Te Igitur. You yourself perform a miracle every time you consecrate the Host and Chalice, or raise the dead to life in the confessional. 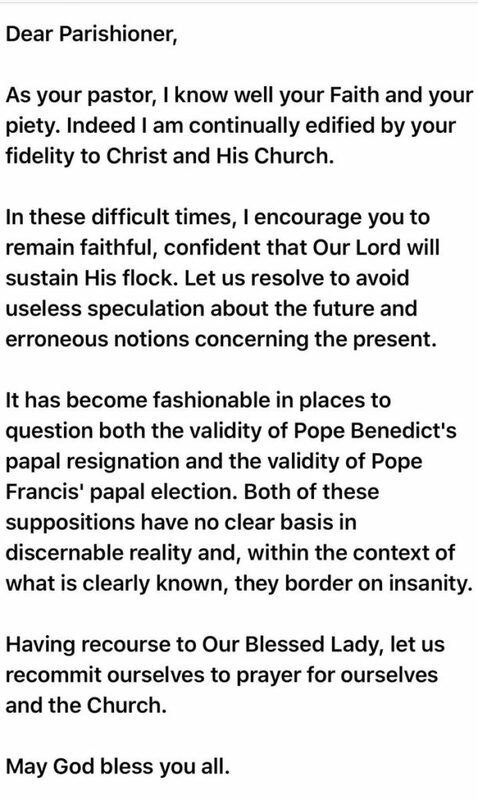 I also understand better than you can imagine how you must be frightened for the future of the Ecclesia Dei communities and Masses. Believe me. I know. If you ever want to apologize for publicly painting me, and those who have come to the same conclusion that I have, as “bordering on insanity” – a truly grave accusation: to say that I am isolated and alone in the universe, being cut off from reality and rationality, and thus from God Himself Who IS Reality and Who IS Rationality – you will be forgiven faster than the time it takes for the email to traverse the internet. This entry was posted in Uncategorized on November 24, ARSH 2018 by Ann Barnhardt.